The series known as the 'DOUGLAS TRILOGY is driven by the documents and contemporary chroniclers where only the conversations are imagined. A wonderful excursion through the life and times of real people living in the 13th and 14th centuries, the books detail daily life in medieval Scotland that few readers have experienced before. Well researched, the author uses primary sources including original documents held at the National Archives in Richmond, Surrey in England. Extensive studies were undertaken using the author's own collection of rare books as well as those sources found in many libraries including Harvard University Medieval Studies and The National Library of Scotland in Edinburgh. Every effort was made to produce an authentic story line. Some of the research is presented in the many pictures and documents on this site: photographs of the ruins, actual sites of the places these doughty Douglases lived and loved add dramatically to the already compelling drama of the Scottish Wars for National Independence. 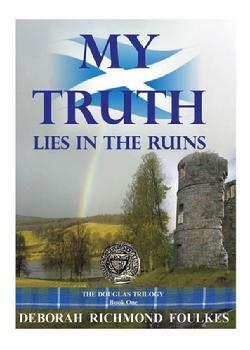 MY TRUTH LIES IN THE RUINS is the first volume of the DOUGLAS TRILOGY. The story is centered on the life of William le Hardi Douglas, Lord Douglas; the first nobleman to join ranks with William Wallace. A Crusader, a knight of renown, and Baron of Douglas, Sir William leads a life of true courage. His rebellion against the illegal English overlord with Wallace ends with his capture and imprisonment in the infamous White Tower at the Tower of London. His life was ended there on November 6th 1298; executed for his patriotism and passion for Scottish independence. The book is also the story of his life and the family he loved; spanning the years of 1250 to 1302. An excerpt from MY TRUTH LIES IN THE RUINS is linked to the cover's image. The writings illustrate the author’s ability to bring these medieval people alive in their time-lost settings of moats and castles, curtain walled fortresses and battlemented tower keeps. Grand canvases of spectacular scenery and energy of the times dominate throughout: knights on horseback in full armaments; sword fights at Fawdon Manor against overwhelming odds; an early morning siege on Fawside Castle with horse and full armaments, the raid of the heart as le Hardi rescued his bride from Edward’s grasp; and a kidnapping from Douglas Castle where Lady Douglas and her children are under siege of a future king. The final pages are filled with treachery ‘de mischef’ and overwhelming tragedy; Lord Douglas, unable to compromise his truth he pays the ultimate price of a martyred end. The second installment of the Douglas Trilogy, IN THE SHADOW OF MY TRUTH begins where the first book leaves the reader, in 1302. The storms of fate on the horizon of Scotland’s future encompass this compelling saga as a young widow struggles to sustain her family, to fulfill a deathbed promise to her husband: to return them all to Scotland. James Douglas, le Hardi’s eldest son, bore a deep love and an impassioned devotion to his father; the loss he suffered for William’s execution prompted his unparalleled quest for retribution against the English. This sequel bears the fruit of the first book; the legacy of William le Hardi, the untimely end of the martyred patriot during Scotland's Wars for National Independence, are revenged by a devastated son. 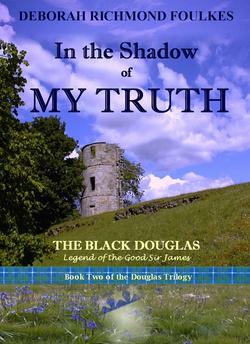 The legend of the Good Sir James, the Black Douglas to the English, is also the story of a boy’s simple desires for his family; to become Lord Douglas like his father and grandfathers before him and restore the Douglas Clan to their rightful lands, their Douglasdale. IN THE SHADOW OF MY TRUTH is a compelling and emotional tale that only true history can weave with events and the people that lived them. 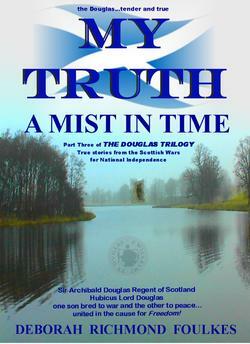 The third Douglas book in the series on the medieval Douglases, MY TRUTH A MIST IN TIME. Follow the cause of Archibald Douglas, Regent of Scotland; discover why Hugh had to resign as Canon of the Glasgow See; live the adventures of Will, James’ first son and heir to all his lands, the manors covering occupying nearly one third of Scotland; follow Will’s cousin, another William and the first Earl of Douglas as he travels to Normandy with King Davy in Exile; then join in the battles of the redoubtable lord and consummate soldier, Archibald the Grim, the youngest son of the Good Sir James. An excerpt from the first chapters of this new book are now available by clicking on the book's cover image to the right. 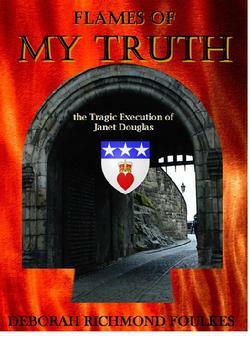 FLAMES OF MY TRUTH is the true story of Janet Douglas, Lady Glamis, and her second husband Archibald Campbell, Keeper of Skipness. They were star crossed lovers in arranged, loveless marriages until Lord Glamis died and Lady Campbell divorced, to marry a lover. Janet and Archibald were wed at last only to fall victim to King James’ revenge against Douglases. Janet was a woman of extraordinary beauty; the stalwart granddaughter of Archibald Douglas, powerful nobleman known as Bell the Cat, Earl Angus. Archibald Campbell was the brother of Colin Campbell, Earl Argyll; a man of core values, Lieutenant of the King’s Third Army. A story of true love destroyed by revenge and betrayal. In the end the couple faced a decision, to expose the true heir to the Crown, put Scotland in political peril or accept their own martyrdom, keeping silent. Lady Glamis was executed for crimes she did not commit. Archibald Campbell’s trial was cancelled; he was murdered by Maclean in a rage of Highland revenge.